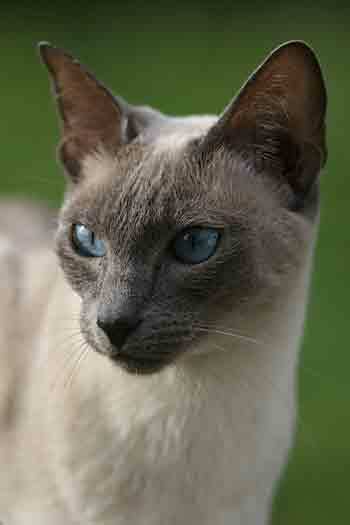 Siamese cats are recognized and admired all over the world. They have a distinctive appearance and aristocratic poise. Their pointed coat pattern came from East Asia, probably Thailand, at least 500 years ago. They were kept by royal families and in temples, it is thought that they were brought to Britain in the 1870s, possibly as a gift from the King of Siam to Owen Gould, the British Consul General in Bangkok in 1884. His sister is believed to have bred from them. The history of the breed contains some wonderful legends, many explaining their unique physical characteristics. For example, the beautiful blue eyes have been described as reflecting heaven in reward for guarding the Buddhist temples. 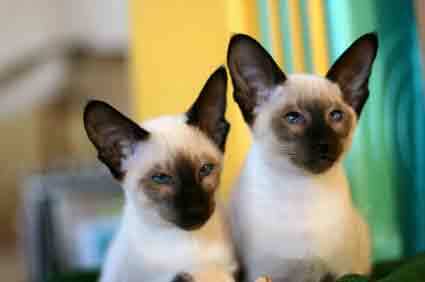 The first Siamese cats bred in Britain were quite different from those seen today. They were heavier and their heads were rounder. The eyes had a definite squint, however, this is regarded as a fault these days. A legend relating to the squint relates that two cats went into the jungle in search of a missing royal goblet. After much searching, they found it, but feeling it was unsafe to leave it unattended while they went back to the temple for the priest, they agreed that the male would go back to the city to tell the priest about their discovery, while the female guarded the goblet. The journey back to the temple took many days, and during that time, the female cat would not let the goblet out of her sight. She stared at it so long that she began to squint. Eventually she fell asleep, and curled her tail around the gobletís stem so she would disturbed if anyone tried to steal it. By the time the male cat returned with the priest, she had given birth to a litter of kittens, all of whom had squints and kinks in their tails. Another story about the kinked tail describes a Siamese princess who used to hang her rings on the catís tail while she bathed. Once, however, when she returned to put the rings back on her fingers, she found they had slipped off the catís tail and were lost. To stop this from happening again, she tied a knot in her catís tail and ever since, all Siamese cats have had a kinked tail. Over the years, Siamese cats bred to be shown have become lighter-boned and elongated and are expected to have a wedge-shaped head, particularly in North Amercia. Some breeders however, prefer the older type which had a heavier build and a rounder head. There are more than eight varieties. The basic and most popular type is the Seal Point, with its seal-brown face mask, ears, tail, legs and feet over a base color of cream shading to pale tan on the back. Siamese cats have a head that looks long and well-proportioned with large ears that are wide at the base, narrowing to a pointed tip. They have clear-blue, almond-shaped eyes are well spaced, having an Oriental, slanting shape. Their bodies are long and sleek with slim legs and small oval feet. The tail can be straight or kinked. 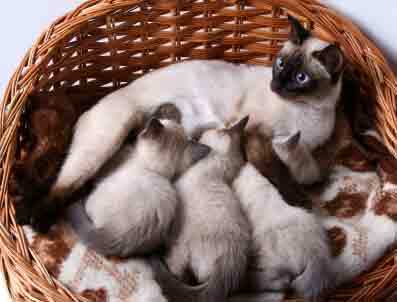 Early Siamese always had a kink in their tails, but modern breeders regard it as a fault. 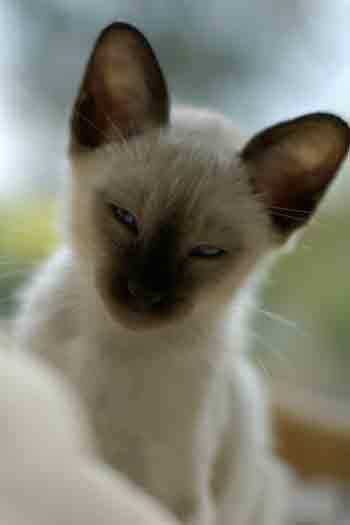 Siamese cats are very attentive and affectionate, taking an active interest in all that goes on around them. They seem to need human company, and although this usually means they give lots of love and warmth, they can feel hurt if neglected. They like company, and are a good choice if you have other pets. The breed is well known for its intelligence and playfulness. Cats quickly learn how to open cupboards and can learn tricks with a little encouragement. Anyone who has owned or known a Siamese cat can tell you about its penetrating voice. Their howls and calls can be bloodcurdling, and are often made in the middle of the night. That said, they make excellent pets.